For the past 30 years, there hasn’t been any shortage of zombie games to play. Now, in 2017, zombies are more popular than ever, thanks to great games, TV series and movies that have been released over the past few decades. I’ve certainly played my fair share of these types of games, so it’s safe to say that I know a thing or two about the genre. In fact, it’s one of my favorite video game genres right now, and I don’t see it dropping down on the list any time soon. So if you’re into killing zeds, walkers, Zs, the undead, biters, dead ones, creepers, and roamers, here’s one of the ultimate zombie games of all-time - Zombie Graveyard: Kill Frenzy. It is a shooting and jumping platformer developed on the iOS platform by Mustafa Mohammed, designed for both iPhone and iPad. This zombie killing game will bring you hours of fun and challenge your hacking skills to the fullest. Plus, it enables you to enjoy smooth touch screen controls, cool characters and tons of other fun features. Zombie Graveyard: Kill Frenzy features 30 exciting and challenging levels that take you on a slashing and shooting journey, through an infected graveyard full of hordes of zombies. The main objective is to kill as many zombies as possible and find the key inside one of them. This way you will progress to the next level and win cool achievements. Use powerful boosters, different weapons and play with different heroes: the redneck, assassin, robot and 5 ninja warriors. Don’t forget to upgrade your heroes and get a sweet victory – save the whole world from this awful apocalypse. 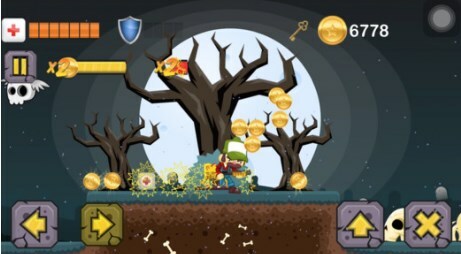 Have fun with this side scrolling zombie massacre adventure, download it for free from the App Store.